Apple's latest version of OS X, Mavericks, is now available at the low, low price of zero, zip, zilch. The iLife and iWorks creativity and productivity suites have also been marked down to nothing for buyers of new iOS and Mac hardware. "Today we're going to revolutionize pricing, because the days of spending hundreds of dollars to get the most out of your computer are gone," Apple software engineering chieftan Craig Federighi told the attendees at Tuesday's product rollout event in San Francisco. "Today we announce a new era for the Mac, because today we're announcing that Mavericks is free," he said. "Free is good." The upgrade to OS X version 10.9 – all 5.29GB of it – is downloadable from the Mac App Store beginning Tuesday, and is available for a broad range of Macs running the three most recent versions of OS X. Installing it is a matter of a few clicks and then going for lunch while the thing does its work. "Whether you have our latest release, Mountain Lion, or even if you've never upgraded and you're still running Lion, or if you're a complete laggard and you're still back on Snow Leopard," Federighi said, "in a single-step update you can get to Mavericks." Federighi also gave a once-over of some of the new features of Mavericks – an upgrade he referred to as "a doozy." Most of what was demoed had been announced at Apple's Worldwide Developer Conference this June, including under-the-hood core technologies that Federighi said are designed to "fundamentally upgrade your hardware." The power-savnig aspects of Mavericks, he said, will increase battery life on the 13-inch MacBook Air, for example, by one hour when browsing the web and 1.5 hours when viewing iTunes videos. Memory compression – which works "almost instantaneously" – allows Mavericks-equipped Macs to cram "six gigs of data in just four gigs of system RAM." Graphics-memory usage has also been tweaked. "In the past," Federighi said, "OS X allocated a static amount of memory set aside for graphics, but Mavericks is much smarter." If you're running a task that requires a lot of memory but doesn't need much graphics performance, for example, memory will be freed up for the CPU to play with – and vice versa. 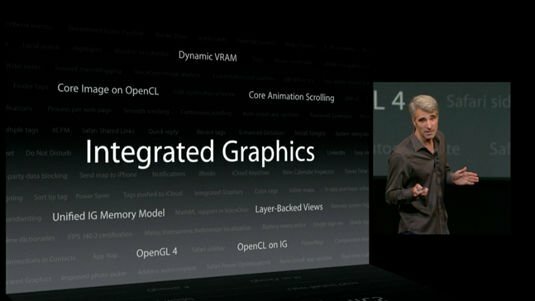 OpenCL support has also been added for integrated graphics chipsets. User interface enhancements include the ability to share URLs with others on Twitter and LinkedIn when in the new Safari app, tabbed Finder windows and the option to tag files into groups, the ability to respond to Notifications directly in that service, and other enhancements. Federighi also touted Mavericks' "fantastic new Maps app," but seeing as how Apple has stumbled badly in this area before – just ask ex-exec Scott Forstall – we'll have to spend some time with it before we can comment on his enthusiasm. But did we mention that Mavericks is free? In addition, Apple's new "free" mantra also extends to its iLife and iWork application suites – that's iPhoto, iMovie, and Garageband in iLife and Numbers, Pages, and Keynote in iWork. Previously, iPhoto and iMovie for the Mac cost $14.99 each – Garageband was free – and the iWork apps cost $19.99 each. 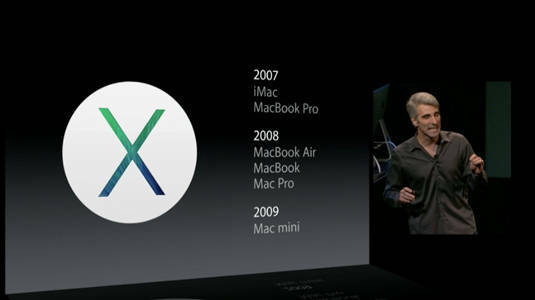 Now each of them have been updated for both iOS and OS X: the iLife apps have been upgraded to take advantage of the 64-bit A7 processor in new iDevices, and the iWork apps "completely rewritten from the ground up" for OS X, according to Apple's SVP for internet software and services Eddy Cue, also appearing at the event. "Others would have you spend a small fortune every year just to get their apps," Cue said. "But we want to do something bold, something that changes the rules of the game – and you know what's coming. We're taking all of these productivity apps and making them available for free with the purchase of Mac and iOS [devices]." The iLife apps, Apple says, will also be available for free on new Mac and iOS devices – although there will be in-app purchases available in Garageband should you choose to beef up some of its capabilities, such as the new customizable "Drummer" drum-track–building feature, created from samples of "some of the best session players in the world," as explained during a demo of that feature.